Well before Hillary Clinton, first lady Eleanor Roosevelt (1933 - 45) , estranged from her husband President Franklin Delano Roosevelt in marriage but very much his partner in politics, was the leading voice for progressiveness and social justice in the United States. Interestingly, evaluation of her correspondence points to the fact that she very well could have been a lesbian in her later years, a fact that President FDR used to joke about. The New York Roosevelt family, one of America's wealthiest and most socially prominent, produced not one but two of the greatest Presidents - her husband, Franklin, who won four consecutive elections (a constitutional amendment was passed after his presidency limited Presidents to two consecutive terms), as a Democrat, and her uncle, Theodore (Teddy) Roosevelt, who was President of the United States from 1901 - 1909. Teddy Roosevelt won the Noble Peace Prize, assumed office at the age of 42, the youngest person to do so, and was a Republican- back in the days when the Republicans were socially progressive and actually added some value to society. The legacy of Eleanor Roosevelt is still very powerful in liberal and progressive Democratic Party circles. 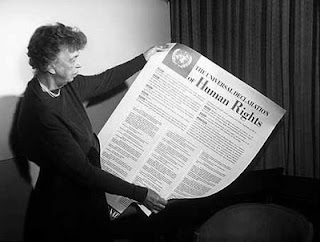 She is considered crucial in getting the (much ignored) United Nations Declaration of Human Rights passed in the late 1940's as special ambassador to the United Nations despite a great amount of opposition. Today, we celebrate the 125 anniversary of her birth in 1884. She appeared on What's My Line in the 1950's. We can hear her patrician tones in this interview. Now this next video caught me by surprise. Its Mrs. Roosevelt endorsing some margarine in 1959. She apparently donated her actor's payment to charity. How times have changed- Could anyone imagine former first ladies Hillary Clinton or Nancy Reagan doing something like this today?